Be THE Superstar at any rodeo. Unique genuine Lizard design belts in Black, brown, or Pink. 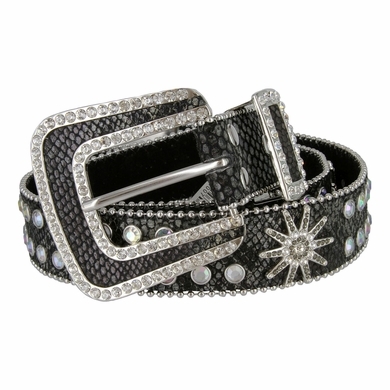 Matching lizard fabric buckle sets enhanced by an attactive rhinestone border. Metal beadings along the sides for a stylish look. Size available: Small/Medium = 33" to 35" and Medium/Large = 37" to 39". Sizing: Measure around where you wear the belt, with your pants on, and order that size.